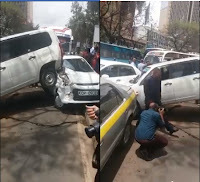 Home / Entertainment News, Videos / Was this Probox driver flying, See this accident that happened along Kenyatta Avenue (VIDEO). Was this Probox driver flying, See this accident that happened along Kenyatta Avenue (VIDEO). Thursday, September 13, 2018 - This accident happened along Kenyatta Avenue in Nairobi’s CBD on Thursday noon. A speeding probox literally flew in the air after losing control and landed on top of an Uber Chap-Chap. This shows you how some Kenyan drivers are reckless on the road.